German 20-year-old Michael Eiler became the first German to win the EPT since Team PokerStars Pro Sandra Naujoks won EPT Dortmund in season 5 in March 2009. The bolsty young German pushed aside hopes of Negreanu clinching his way back in the All-Time Money List, who fails to progress more than half an hour through the final day. 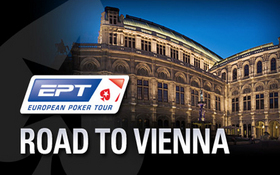 The PokerStars €5,300 buy-in EPT Main Event in Vienna contained just fewer than 600 entrants with an exciting climax on the final table. The 6-day tournament began last Tuesday with a massive prize pool of over €2.9 million distributed to the top 80 players. Negreanu, who was the pre-ordained winner of the event with more than $13 million in tournament winnings behind him (plus wins in the WPT and WSOP) failed to accomplish the mythical Triple Crown of championships by adding an EPT to his belt. The Kid Poker star from Canada did manage to make it to the final table as the chip leader ($5 million), however a series of crippling hands left him leaving the event early. One such hand involved Nanos doubling up his 1.5 million chip stack after squaring up his pocket queens against Negreanu’s pocket tens. Spectators had to wait another full 2 hours before Cainelli, holding pocket jacks, eliminated Lotze’s pocket tens in 7th place. Negreanu’s chip stack took a severe blow after his two-pair K-9 ran into Hruby’s straight (7-6 on the board 8-5-K-9. A blank on the river moved Hruby into a sizeable chip lead and practically left Negreanu impotent, subsequently leaving in 6th place. The tide was completely different for Michael Eiler however. After starting the final table with 2.1 million chips, the PokerStars online qualifier Michael “mae9690” Eiler won the first 4 hands, and eventually went into heads up with Hruby as the 2.5:1 underdog. Things quickly turned to Eiler’s favour however, who now managed a 2:1 chip lead over Czech pro Hruby. The winning hand came when Eiler’s suited A-10 cracked Hruby’s pocket deuces as the flop showed all diamonds. Game, Set, Match, and a nice €700,000 pay day for the online poker player, who previously won the Sunday Million in March for $260,000 and stated that winning an EPT was an absolute dream for him and a massive boost to his poker bankroll. This entry was posted on Friday, November 19th, 2010 at 6:00 pm and is filed under Poker News. You can follow any responses to this entry through the RSS 2.0 feed. You can leave a response, or trackback from your own site.